Ondinen tuottaja Seppo Siirala on osannut valita musiikkia, jonka tunnelma sopii täydellisesti siihen, mitä levyn ostaja odottaa. Mainosteksti lupaa, että levy tuo syksyn ja talven pimeisiin hetkiin valoa ja lämmintä viihtyisyyttä, ja sen se todellakin tekee, vieläpä paremmalla ja kunnianhimoisemmalla musiikkivalikoimalla kuin kokoelmilta on totuttu odottamaan. 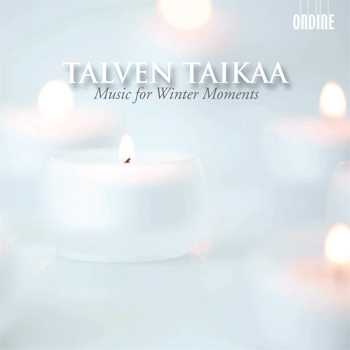 Talven taikaa ("Winter Magic") offers a suitable collection of Finnish classical music for winter days. Performances by top soloists, choirs and orchestras from Finland invoke the magic of the Finnish winter. As harsh as conditions might appear, winter exudes a mainly positive meaning for Finns: it is the season of high productivity in work and cultural life, and ideal for a range of sports activities. Most importantly, it is the season of recreation and wellness at home, by lighting candles and putting on some good music! This CD includes a poetic essay in Finnish, as well as an English text that is more specifically targeted at a foreign discoverer of the Finnish winter. The booklet also includes evocative photo illustrations. This product can serve as a gift for foreign or Finnish friends, for business partners, or simply for oneself. It should make you enjoy and relax!